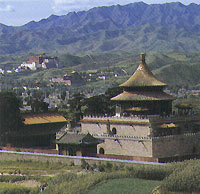 The Eight Outer Temples refers to a group of monastic complexes situated outside the Mountain Summer Resort of Chengde. Built between 1713 and 1780, these temples are mostly oriented to the resort in the manner of stars surrounding the moon. The Eight Outer Temples combine with the resort to form a splendid congregate of Chinese architecture. Whether observing these temples from within the resort, or vice versa, one can derive immense artistic enjoyment from what meets the eye. Among these temples are the Putting Temple, the Pule Temple, the Temple of Putuo Sect, and the Sumeru Temple of Good Fortune and Longevity.